The Magic Kingdom theme park is the pinnacle of the Walt Disney World resort and this is the case during the Christmas Season as well. During the the week of Christmas and New Years Eve, there are several holiday shows and parades to view including Mickey’s Once Upon A Christmastime Parade that has gingerbread men, toy soldiers, reindeer, and Santa Claus in addition to the classical Disney Characters. In the Mickey’s Most Merriest Celebration stage show in front of Cinderella Castle, Mickey Mouse and his friends sing and dance to many popular Christmas songs. At Night, Cinderella Castle comes alive with Christmas Lights as the Fairy Godmother helps to light the castle in a twilight ceremony called Cinderella’s Holiday Wish. Also at night is the Holiday Wishes – Celebrate the Spirit of the Season show that features fireworks set to holiday music behind Cinderella Castle. 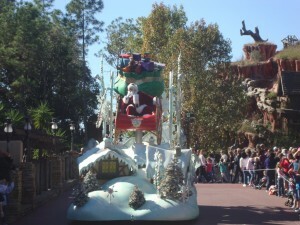 Santa Claus is available for visits at the start of Main Street USA. Beginning in November and leading up to Christmas, Disney World hosts a separate Christmas event at night that includes the parades and fireworks seen during the week of Christmas and New Years Eve called Mickey’s Very Merry Christmas that features shorter lines at the theme park’s top rides. Epcot begins celebrating Christmas the day after Thanksgiving that is highlighted by a nightly Christmas Candlelight Processional at the America Gardens Theatre that features the Walt Disney Orchestra, a celebrity narrator, and visiting choirs that combine their singing and story telling of the miracle birth of Jesus. The performance dates back to a sister-show held by Walt Disney at his original park of Disneyland in California and seats can be hard to come by. The best way to guarantee a seat is to purchase a dinner package that guarantees a seat to the performance as well as a reserved spot for the Illuminations Fireworks show that features a special holiday grand finale. Additionally, Epcot demonstrates how each Country at World Showcase celebrates Christmas with their version of Santa Claus. At the American Pavilion, listen to Christmas Caroling by the Voices of Liberty and visit with both Santa Claus and Mrs. Claus together, the only location at Disney World where you can visit with them together. The nightly Jingle Bell, Jingle BAM! is the main attraction at Disney’s Hollywood Studios during the Christmas Season that features the elves of Prep and Landing for a nighttime spectacular featuring fireworks, lasers, high definition projections and snow, at times all at the same time. Hollywood Studios previously had a very popular dancing light display called The Osborne Family Spectacle of Dancing Lights that ended it’s run in 2015 that featured millions of dancing LED Christmas Lights synchronize to holiday music that was included with park admission. The lights were originally started by the Osborne Family in Arkansas as a single home’s annual display. When the display grew larger than the neighborhood could handle the lights were moved to Disney World beginning in 1995. New for 2016, Disney features it’s first ever drone show called Starbright Holidays – An Intel Collaboration that features many colorful drones performing a short show above the lake surrounding the entertainment district that is free to view. In addition, holiday shopping is in full gear at the Downtown Disney Marketplace where you can find many toys and items exclusive to the Disney Parks resort at stores like Once Upon a Toy, World of Disney Store, and the Lego Imagination Area. At the Disney’s Days of Christmas store that is open year-round, you can select from hundreds of unique Christmas Disney ornaments and stockings. For Christmas, Animal Kingdom features animal-themed Christmas Trees and other holiday decorations. Animal Kingdom previously had a Christmas daytime parade that ended it’s run in 2013. In addition to the theme parks, all of the hotels on property are decked out with Christmas Trees and holiday decorations. Massive gingerbread houses and chocolate creations are on display throughout the resort with the most popular gingerbread house located within the atrium of the Grand Floridian that is free to the public to view. Other displays can be found in the common areas of the Contemporary Resort, the Boardwalk, and the Beach Club.